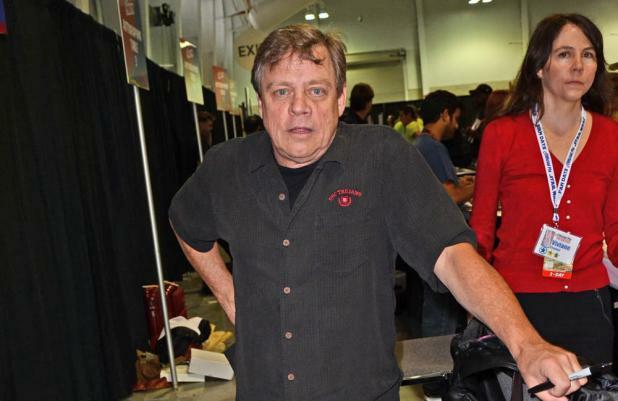 Mark Hamill is unsure if he'd take a part in the new 'Star Wars' film. The actor - who played hero Luke Skywalker in the original trilogy, released between 1977 and 1983 - is wary of signing up for the recently announced seventh 'Star Wars' film, as he has no idea what the story line involves. Speaking to E! News, he said: "We have questions about it. And really, they're not even at the stage where they're able to answer those questions because, as far as I know, is there a story yet?" "Until I know more about what they have in mind, I think it's better to let [studio] Lucas Film make the announcements." In the event he doesn't return to the franchise, the actor is happy to pass the torch on to someone else. Mark, 61 added: "If they were going to do a story where Luke was too young or too old for me to play, they would get an age appropriate actor. There's so many good people." When presented with names such as Ryan Gosling and 'The Hangover' actor Bradley Cooper as candidates for the iconic role of Luke, Mark felt either would be a good choice for the role. He added: "I love actors, number one. There's probably nobody that you could name that I don't like, depending on what it is they're in. Too many to chose just one." 'Star Wars 7' is tentatively set for release in 2015.